Macrophage. 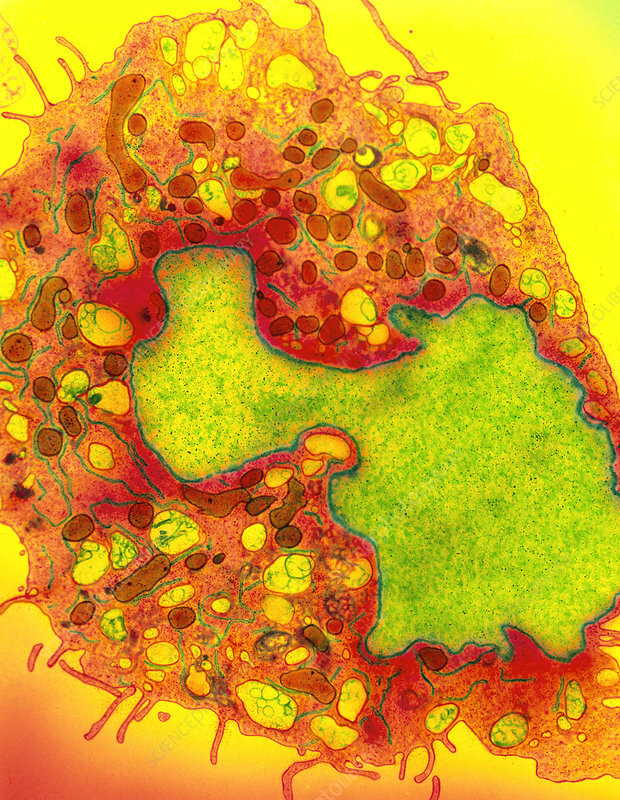 Coloured transmission electron micrograph (TEM) of a section through a macrophage white blood cell (leucocyte). The macrophage's cytoplasm is red, while its large nucleus is green. Within the cytoplasm are lysosomes (yellow ovals), mitochondria (brown ovals) and endoplasmic reticulum (green strands). On the outside of the macrophage are finger- like extensions of the cell known as microvilli. Macrophages, part of the immune system that defends the body against infection, digest foreign bodies. Magnification: x7,200 at 6x7cm size.